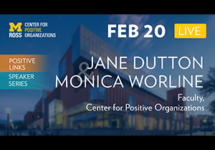 Jane Dutton’s research on Positive Organizational Scholarship (POS) began with an interest in compassion and the difference it makes for individuals and organizations. Her research has expanded to focus on the power of positive relationships at work, job crafting, and positive identities. 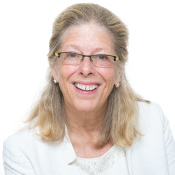 She and Monica Worline have published a new book entitled Awakening Compassion at Work: The Quiet Power that Elevates Individuals and Organizations (Berrett-Koehler, 2017). In addition, Jane and Gretchen Spreitzer edited How to Be A Positive Leader (Berrett-Koehler, 2014) that brought together top researchers focused on how to make POS practical for all leaders. She has written Energize Your Workplace, a book for managers that is based on building positive relationships as a competitive strategy, and has co-edited three other books that address Positive Organizations. Jane’s background in strategic management keeps her focused on how positive dynamics create sustainable capabilities in organizations.